Not everyone can make mayo. Let alone making good mayo. But that’s OK. We have to accept our limitations sometimes and learn let things go and try different things. Making mayo is delicate process. It needs concentration, discipline and hope that we are good enough to make it this time again. 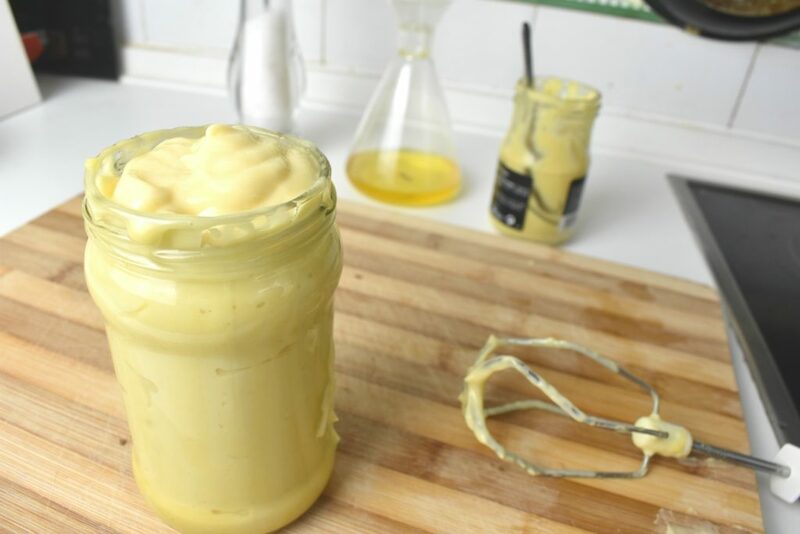 There are several methods to make mayonnaise with different tools using various methods. The most popular nowadays is the one involving an immersion blender and throwing all ingredients into the mixing bowl at once. This is certainly a fancy one but requires all the egg -yolk and white- being cracked into the bowl otherwise it won’t thicken up ever. So if we for whatever reason don’t like egg whites in our mayo then we need to be more patient with the preparation. 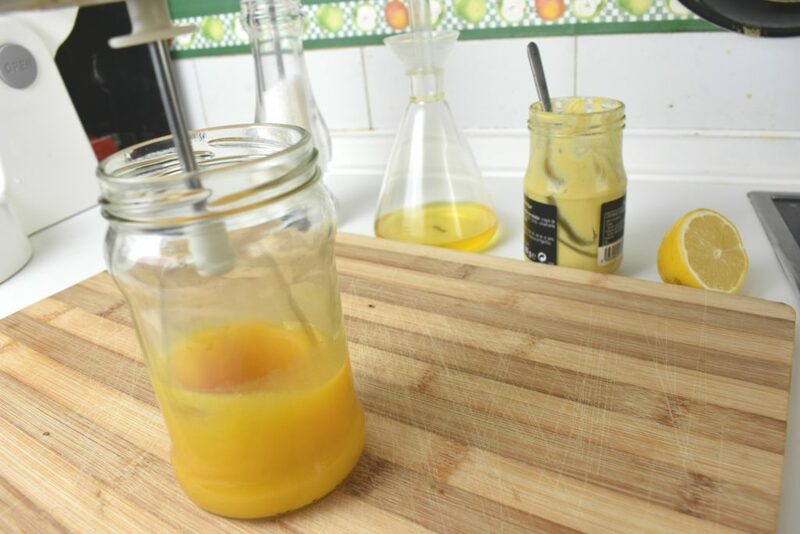 The key of the mayonnaise making is the speed which we use to add the oil to the egg yolks. It must be slow at the beginning and not that slow but still nowhere near to quick after using half of the oil. We can use an immersion blender, a manual whisk, or an electric whisk to whip it up, it doesn’t really matter. Mind to use a tight enough container if we choose the immersion blender as the blades needs to reach the yolk. Pour the olive oil in a measuring jug. Get it ready. Add the mustard to the egg yolks. We can use an empty jar for this or our favorite mixing bowl. The advantage of the jar is that we don’t mess around that much with bowls and a lid can be put on it when it’s done. However, the jar requires a bit of practice as it tends to move around while the mayo hardens. 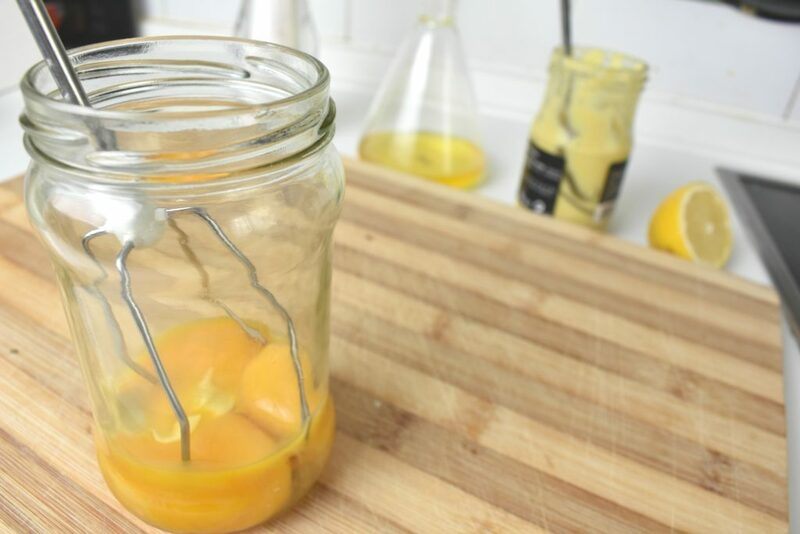 Whisk yolks in a mixing bowl. Pour oil very slowly into the bowl of whisked yolks. Pour only a few drops at a time whilst whisking constantly. With a bit of luck it will thicken eventually. When it is thickened we can put the oil a bit faster but still in a slow and steady stream. Whisk until oil has incorporated completely. When half of the oil is poured in it should be nice and thick. If it isn’t thick by now then the mayo has failed. Get a clean set of tools and try again. The failed creation can be incorporated into the successful attempts later. Now we can add the lemon juice and salt. Optionally, if we are looking for a shop like mayonnaise flavor pour in some sweetener too. Keep whisking and adding the second half of the oil until the end. In case we have any failed attempts that didn’t thicken or broke up then this is the time to use it. Keep homemade mayonnaise in the fridge refrigerated in an airtight container like the jar we have just used. Use it up for about 6 days. 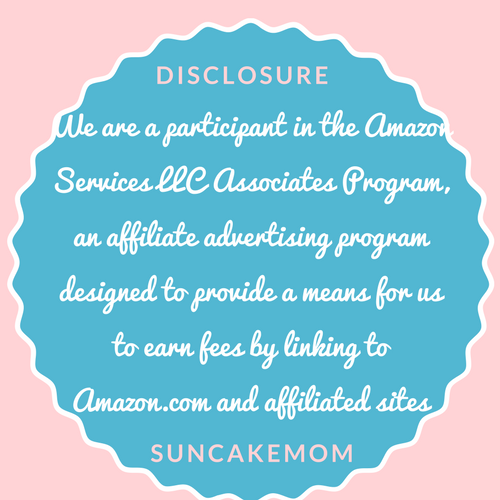 We can make a little reusable label by wrapping both side of piece of paper with transparent tape. This way we can easily write the made by date of our mayonnaise and wipe it off when we prepare a new batch. 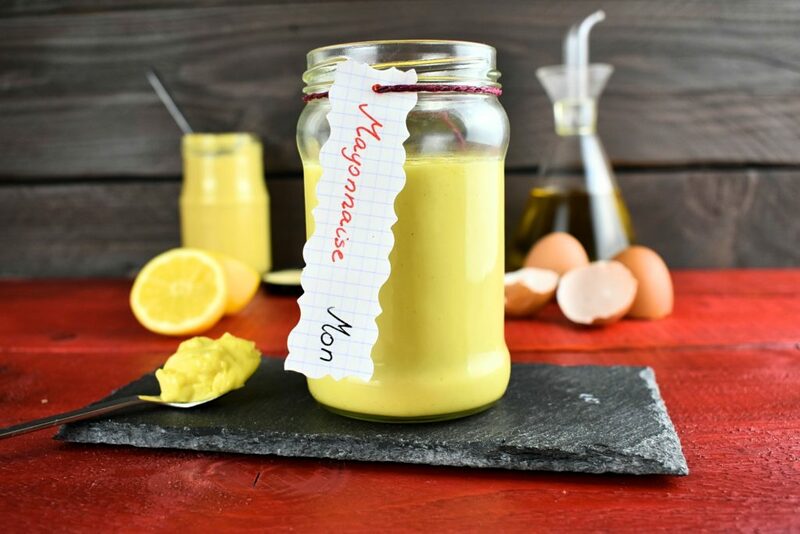 How easy it is to make tasy low carb condiments, right? The nightmare of all kitchen newbies. The mysterious yet humble condiment that makes all food edible. ⅞ cup / 200ml Olive oil use only virgin and NOT extra virgin olive oil because extra virgin olive oil has a very strong taste and at the end it would give a completely different character to the mayo. When half of the oil is poured in it should be nice and thick. If it isn't thick by now then the mayo has failed. Get a clean set of tools and try again. The failed creation can be incorporated into the successful attempts later. Now we can add the lemon juice and salt. Optionally, if we are looking for a shop like mayonnaise flavor pour in some sweetener too. Keep whisking and adding the second half of the oil until the end. In case we have any failed attempts that didn't thicken or broke up then this is the time to use it. 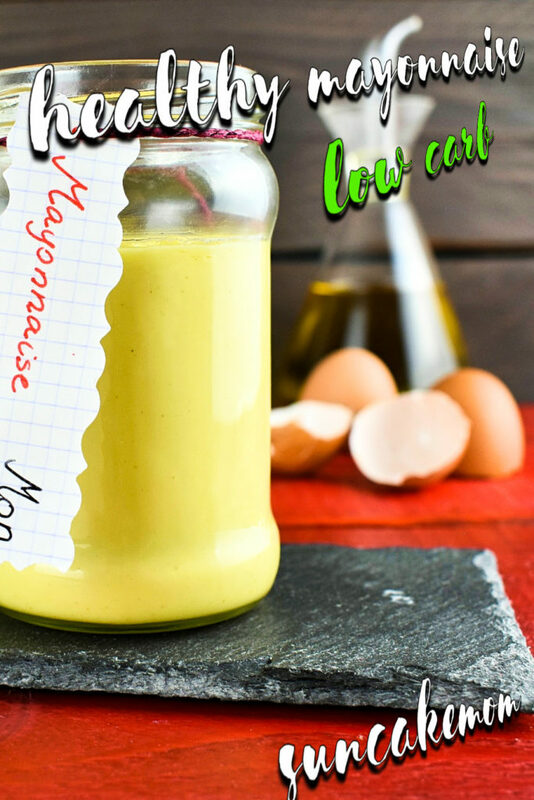 Keep homemade mayonnaise in the fridge refrigerated in an airtight container like the jar we have just used. Use it up for about 6 days. 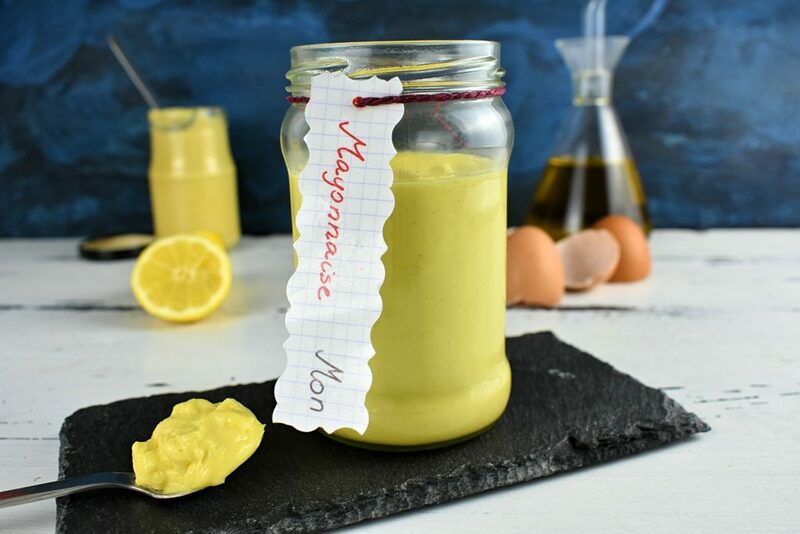 Keep homemade mayonnaise in the fridge refrigerated. Use it up for about 6 days. I love making my own mayo! It’s much more delicious than the store bought thing and I can go berserk with ingredients any time I wish for. That’s the beauty of homemade stuffs!